We dont have a band logo just yet, so were gonna use this ugly black guy sitting on a toilet. enjoy. This is Tips For Lester's official website. We're a local punk band in the Three Village Area on Long Island and we play originals and some covers. Hopefully we'll be playing a few shows this year and we just finished a cd called Pocket Change, just a 5 song Demo so go out and buy it! 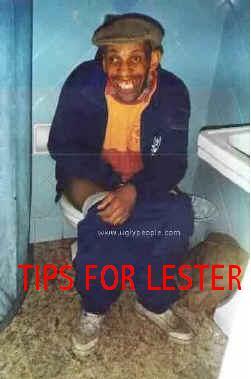 This is Tips For Lester's official website. We're a local punk band in the Three Village Area on Long Island and we play originals and some covers. Hopefully we'll be playing a few shows this year and we're working on our first cd now. We'll let you know when tis done. TFL has always been a five-piece band with singer, two guitars, bassist, and drummer. We started up over the summer with Joe Murphy singing, Mike Matera and Marc Krell on guitar, Tamir Taylor on bass, and Rob Turner on drums. Joe, Mike, and Tamir had already been playing together in Big Jose and they knew Krell was an awesome guitarist. Mike and Krell, with some help from Joe, started writing songs like crazy and in a week we already had five. Soon Rob's obsession with tennis got in the way and once we couldn't play at his house anymore, we started looking for a new drummer. Mike suggested the 11 year old drummer from his old band (Idle Minds) who really wanted to be in a band. Nick replaced Rob on drums and a week later we had our first show at castle golf. Now Ryan's our new drummer and hes amazing.